Laguna Bay Chiropractic is excited to announce that we now offer body sculpting LipoLaser Therapy (weight loss laser therapy). LipoLaser is used to literally melt excess fat from targeted areas of the body. Take a few moments and explore this page to learn more! your fat away with our new LipoLaser! Lipolaser is a completely safe, non-invasive alternative to liposuction. The laser emits energy which stimulates stored fat to be released. The released fatty acids and glycerol are then free to be used by the body to create energy through its completely natural pathways. The LipoLaser literally melts your fat away, giving you results almost instantly. This process also increases collagen and elastin in the skin, to help shrink and tighten loose, sagging skin. Our LipoLaser can be used on the hips, legs, back, tummy, arms and face! Results can be seen immediately! Typically a 2-4cm loss in the abdomen circumference can be achieved over a care plan. For optimum results, we recommend a minimum course of 8 total session over a 4 week period with 2 sessions per week. Fat and cellulite reduction before and after. On your first visit, we'll measure and photograph the region that you want to target. (Don't worry, your pictures and information are kept private on our secure software and are only for you to see your progress.) Next, you'll relax on a therapy bed while the lasers are properly positioned and turned on. You'll feel a relaxing, soothing warmth which will last for 20 - 30 minutes and then that's it, all finished! You'll want to wear something comfortable that allows us to access the region you want to target. Many patients choose to bring some headphones and music. 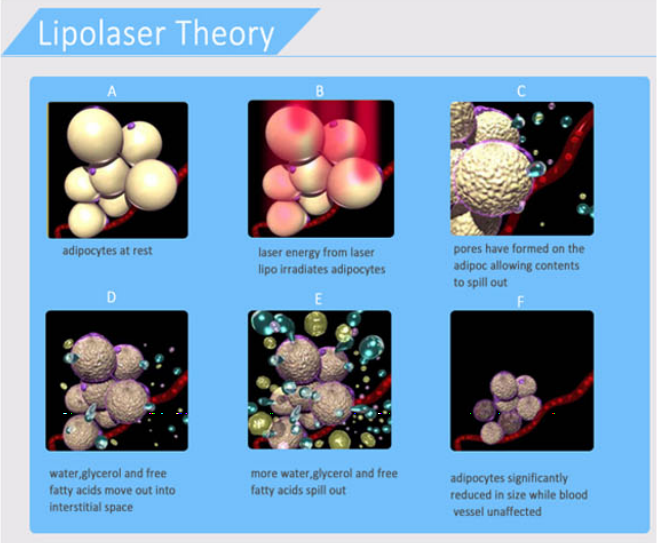 Body sculpting from the LipoLaser does not destroy the fat cell. It causes the contents of the fat cell to be released into the body, making it available for energy use. If the energy demand is not there, the fat will be restored. This is why we recommend 30 minutes of exercise after every session of LipoLaser therapy. Additionally, watching your calories, getting plenty of water and regular exercise will help your LipoLaser therapy be more effective in the long term.